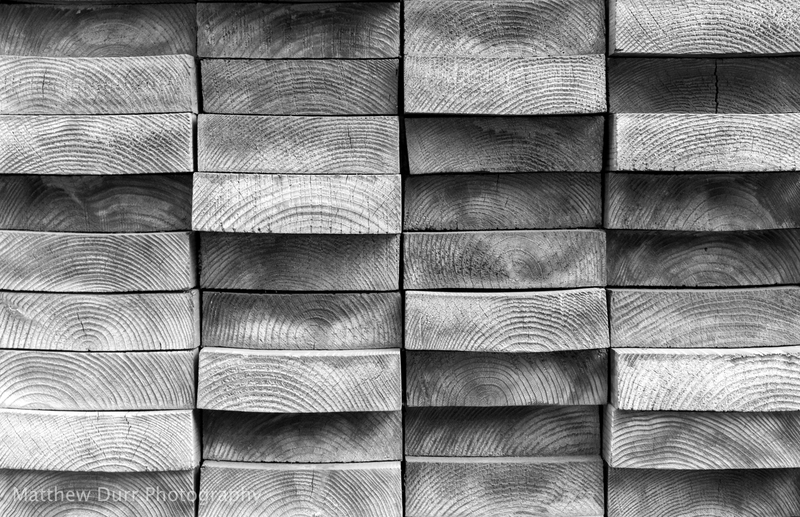 I have always been of the mindset that in late winter, if there’s no snow on the ground, most outdoor photography is just plain difficult. It’s still cold, most flora is dead or in hibernation, and days are short enough to limit time out and about. That said, it is hardly an excuse to stay inside. Gloves exist for a reason, not all plants succumb to the elements, and with some careful planning a photographer can still get many hours of adventuring in before the sun sets! 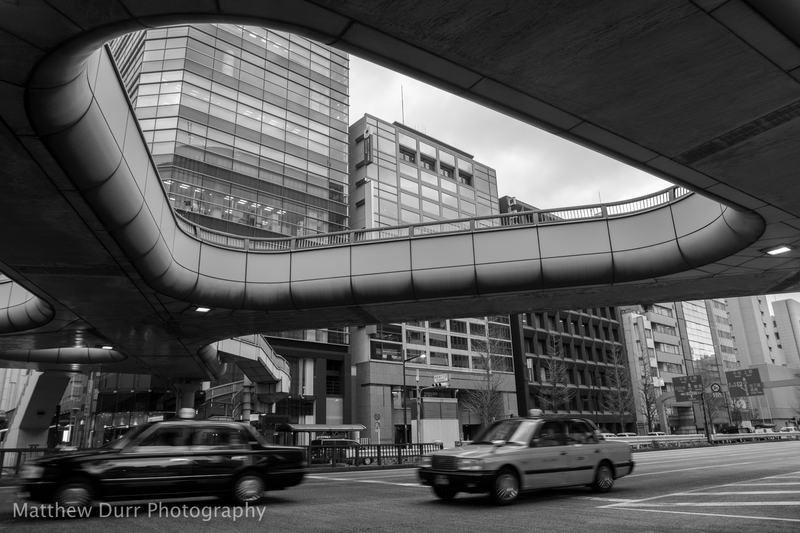 A couple days prior to CP+ in February I set out with a couple friends exploring the Ginza area of Tokyo, with only a loose idea of where to wander to. 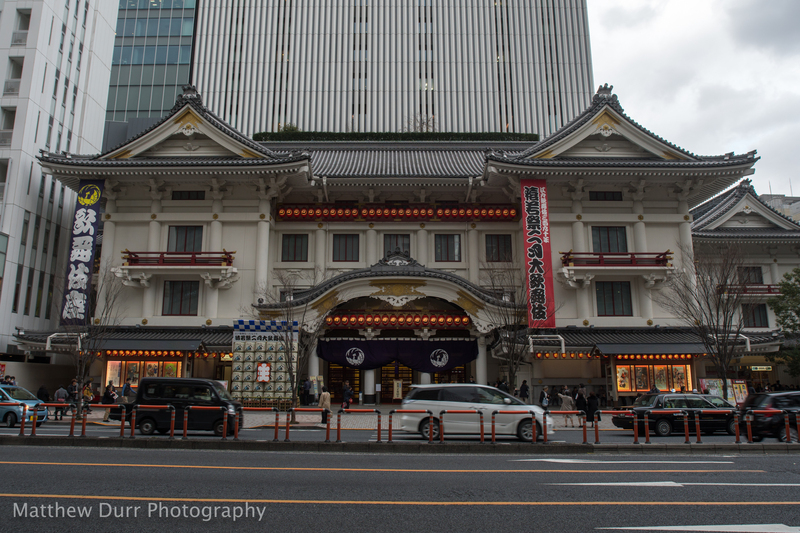 Within the city there were a few street photography opportunities while touring around the many eateries, car showrooms, and historical buildings like the Kabukiza. 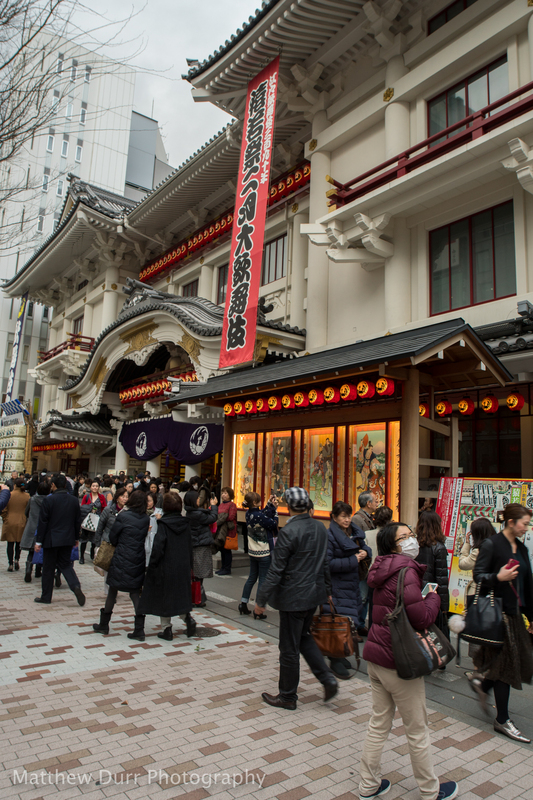 I have yet to see a full Kabuki, a theater performance style that dates back to the Edo period. The exaggerated movements and costumes paired with music on traditional instruments could make for some real cultural enrichment, but as is the case with most popular venues the immediate performances were sold out. Not wanting to wait three hours for a shot at a ticket, we decided to move on for a late lunch. 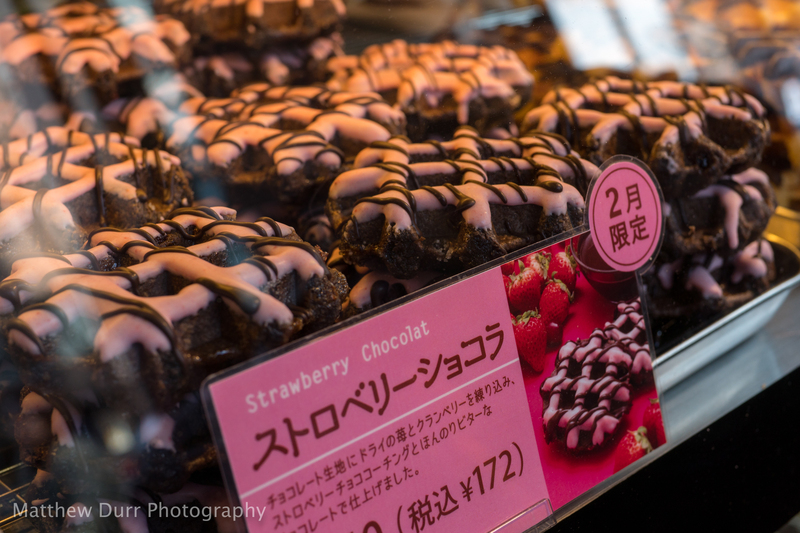 Yet another place to add to the Japan bucket list, I suppose! 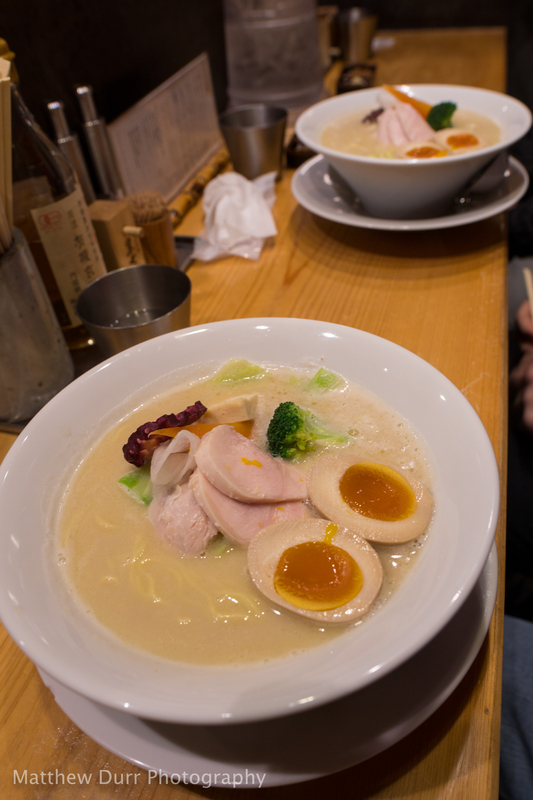 As I have become something of a ramen and soba fanatic since living in Japan, we found the very definition of a hole-in-the-wall soba restaurant sandwiched in a small unnamed alleyway. In fact, I cannot even find the address to the 8-seat restaurant (yes, 8 seats!) on Google Maps! 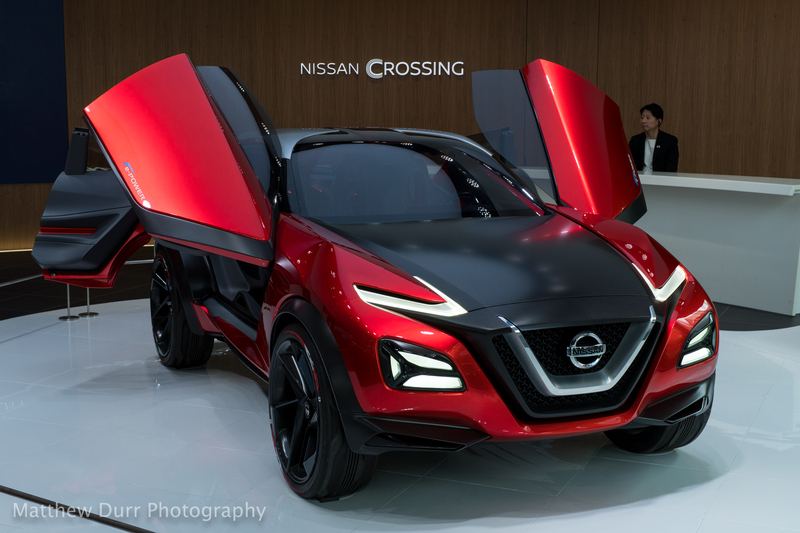 The closest I can give you is 〒104-0061 Tōkyō-to, Chūō-ku, 中央区Ginza, 4 Chome−4−1, 銀座Aビル. 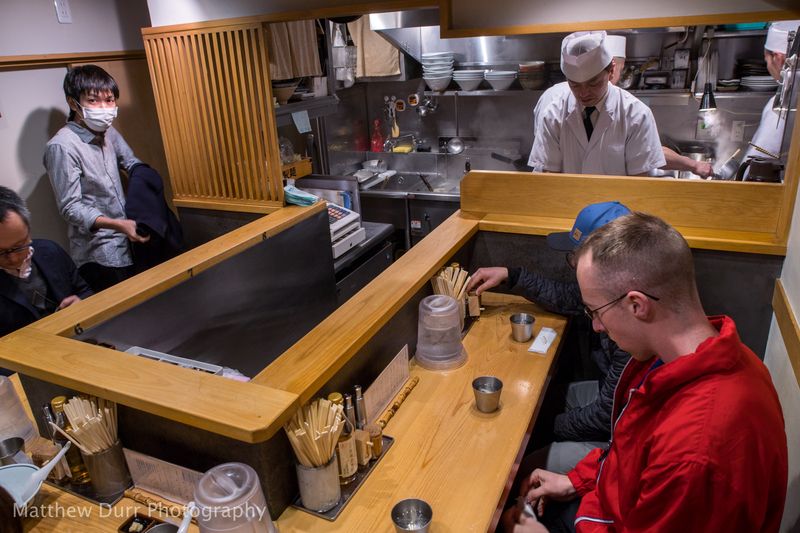 I think that the restaurant is Ginza Kagari, but directions to that name take you to the wrong alleyway. 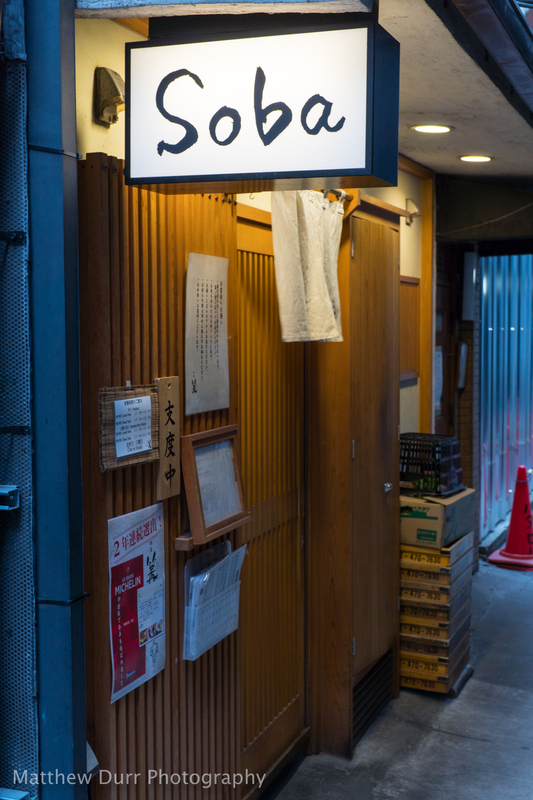 Just keep an eye out for the prominent “Soba” sign atop the door and you’ll be all set to have the best chicken broth soba you’ve ever eaten! 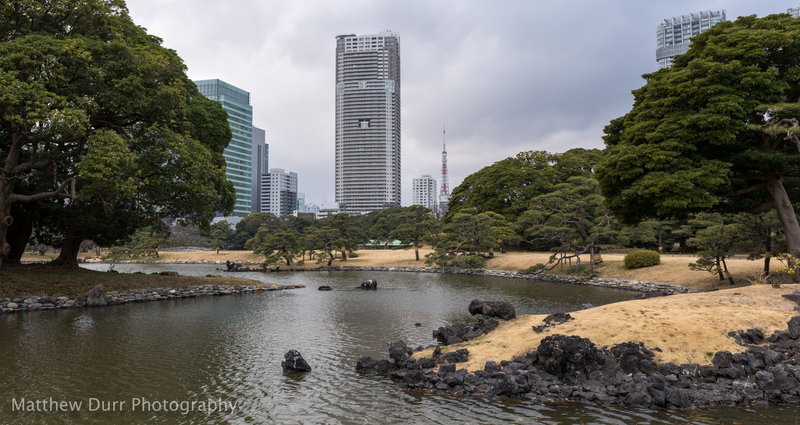 With street photography quotas filled and stomachs happily quieted down, we headed to another one of Tokyo’s historical gardens. 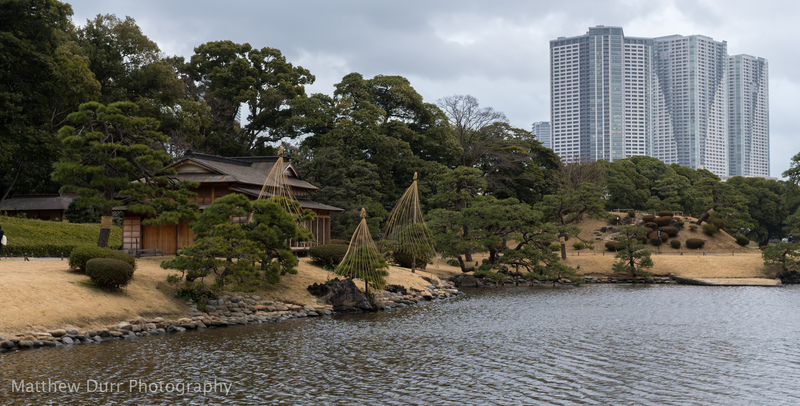 Noted as one of many historic sites and “special places of scenic beauty”, Hamarikyu dates back to the Tokugawa Shogun beginning in 1654(!). 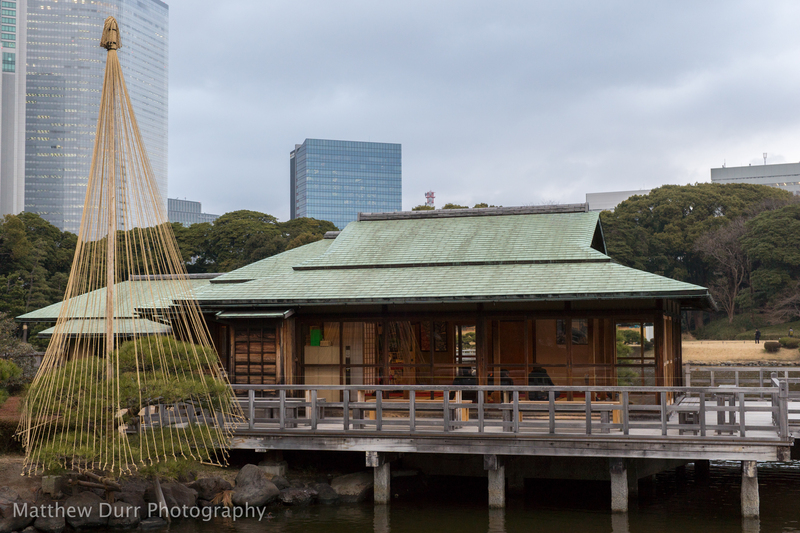 The garden contains the only remaining open ocean pond from the Edo Period in Tokyo, controlled daily by the ebb and flow of the Tokyo Bay tide and the garden’s lock gates and sluices. 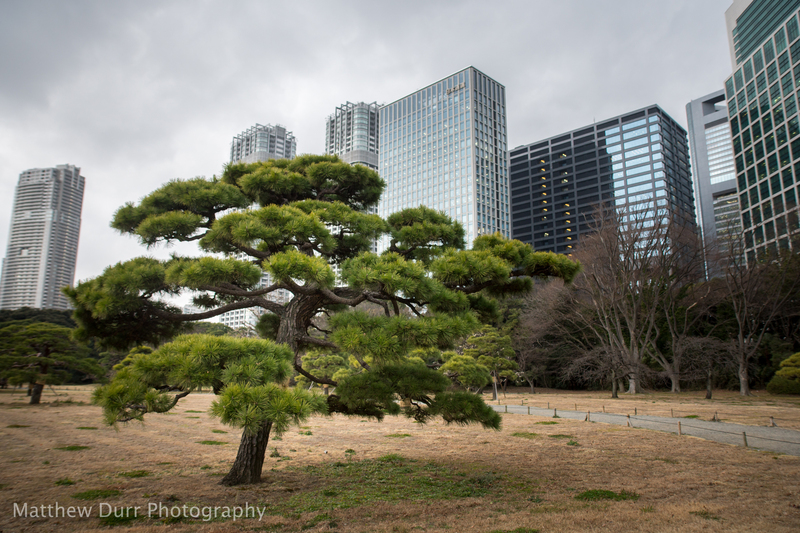 Just like many other gardens in Tokyo, the scenic and peaceful place is surrounded by the hustle and bustle of modern life and towering skyscrapers. Despite some sprinkles of rain here and there, the clouds helped to keep the light soft and malleable throughout the day. 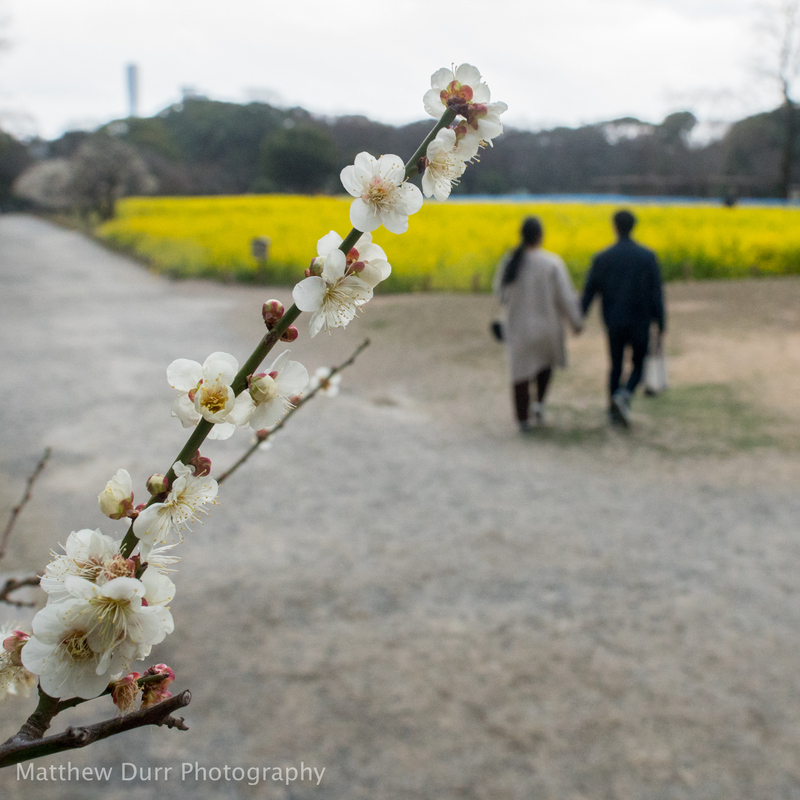 Thanks to careful planning and planting, Hamarikyu sports various blossoming flowers or fall colors almost year-round. 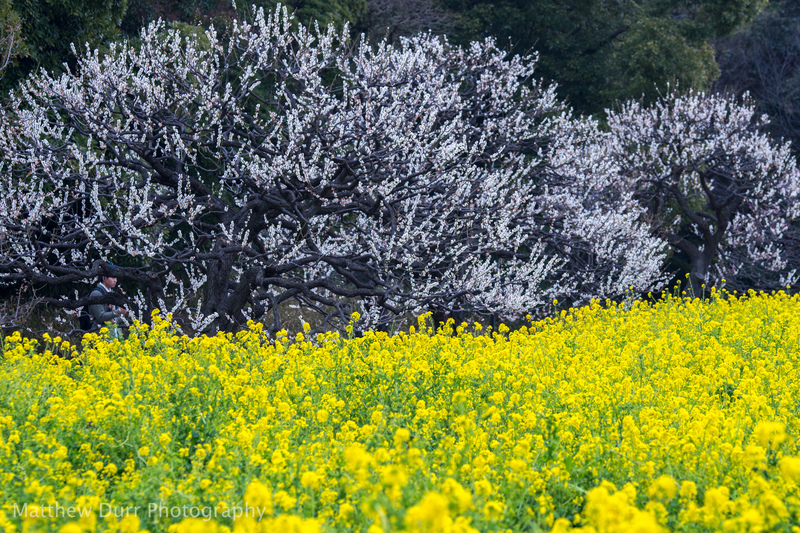 Even in February, featured blooms come in the form of early plum blossoms and vast fields of rapeseed. 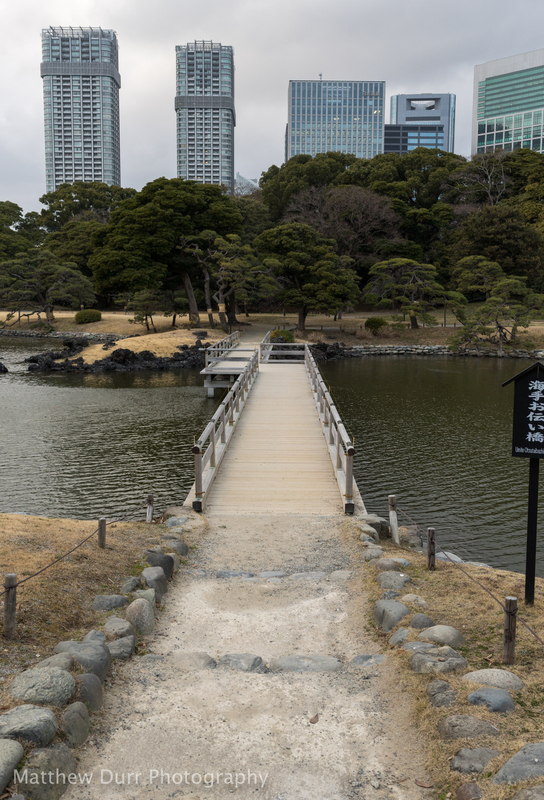 As visitors walk around to the southern half of the gardens, the saltwater ponds quickly become the main feature, peppered with traditional Japanese architecture and landscaping. A keen eye may have caught the odd straw mats tied to some of the trees as well as the rope “teepees” surrounding the canopies of smaller trees along the water. 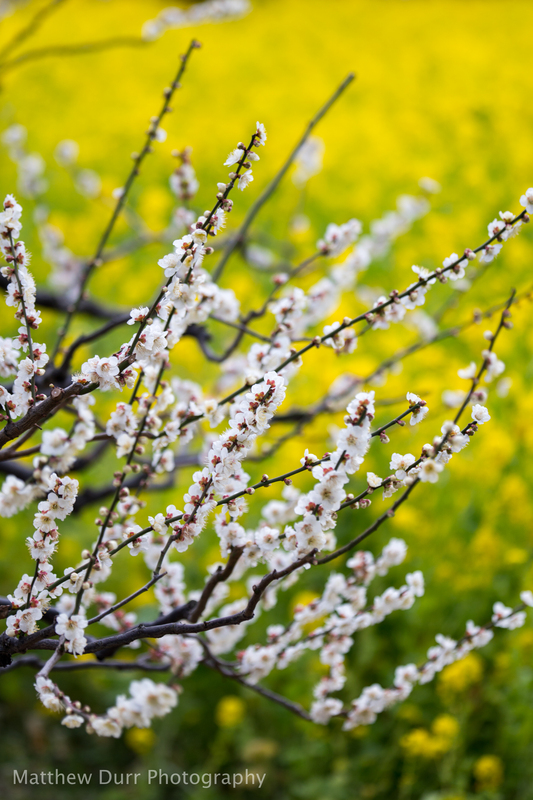 Both are countermeasures many Japanese garden-keepers use to combat the dangers of winter. 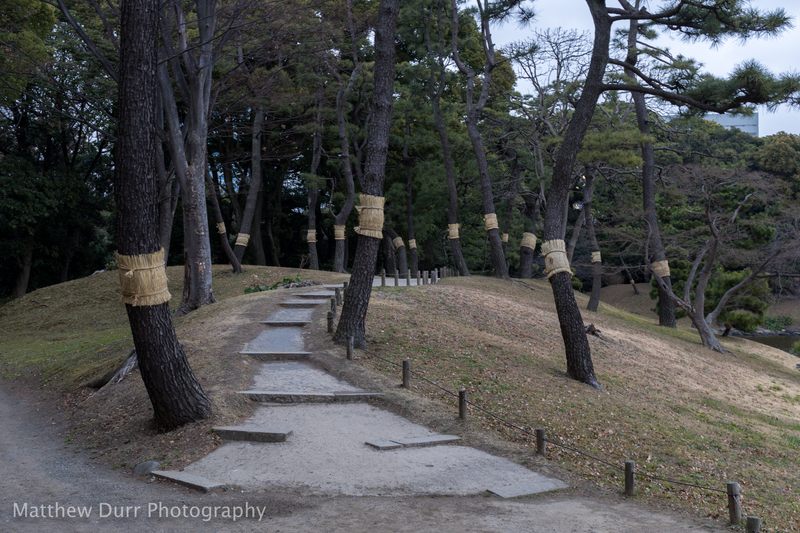 The mats, called mushi taji trick burrowing insects that descend from the canopy of the tree in autumn to burrow into the mat instead of the roots of the tree. Before spring the mats with the insects inside are removed and burnt to help keep the tree healthy. 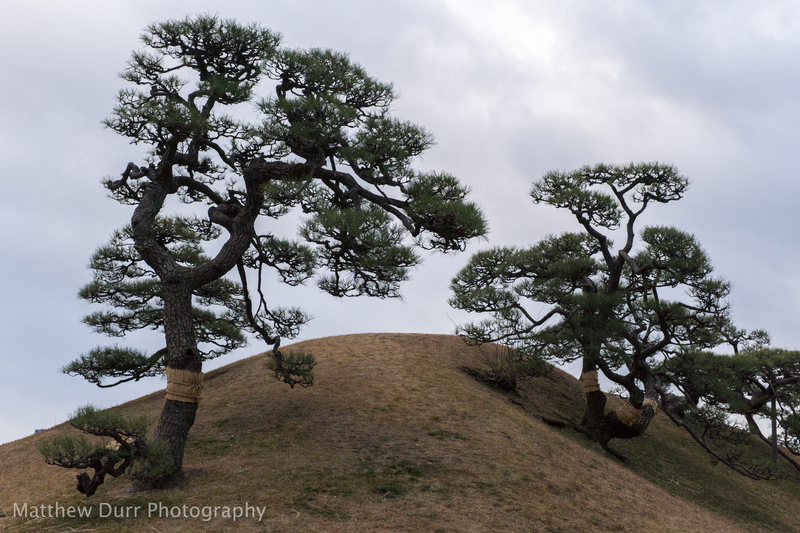 Additionally, yukitsuri is the name of the “teepee” technique used for protecting vulnerable trees against heavy snow fall. 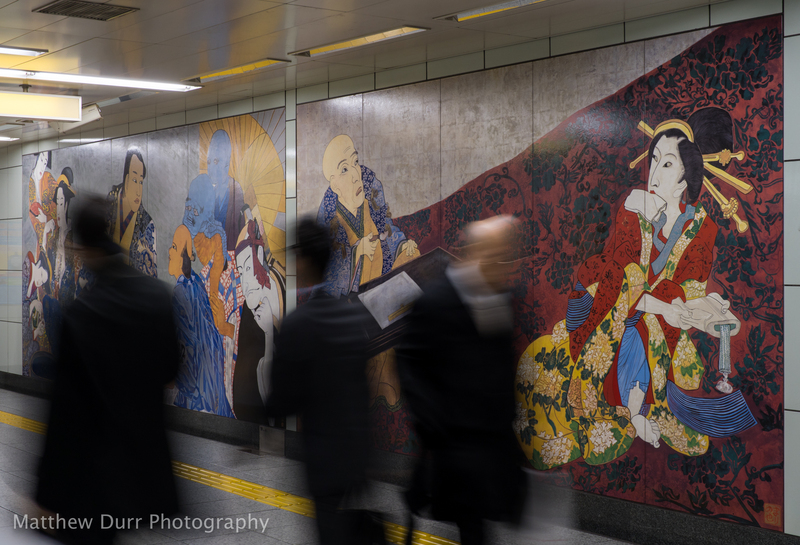 With another cloudy and early sunset, we figured it was yet again a good time to hop back on the train to Yokosuka. In this time I was still trying to prevent injury to my knees, so long trips into the neon nights of Tokyo were a bit out of the question! That’s all for this late-winter post guys and gals, thanks for dropping by! Right in cue with some warming temperatures here and now in early April, the sakura is beginning to show up all around the Tokyo and Yokohama area. Though I still have another post to catch up with, I definitely can’t miss out on capturing my second outing chasing the cherry blossoms! As always, have a great day! ← Site Update: February/March 2017!